A friend told me today that he just set up his baby registry this weekend for $4,000 worth of stuff. Really, dude?? Ditch the wipes warmer–they don’t work. And babies don’t need special laundry detergents that cost twice as much as regular detergent. Much of that stuff isn’t needed. And there are additional ways to cut costs for children. Like buying used baby furniture. Take this baby glider rocker chair that I bought 6 years ago when I was pregnant with my oldest son. I found it at a thrift store for $20. The price was right up my alley…. 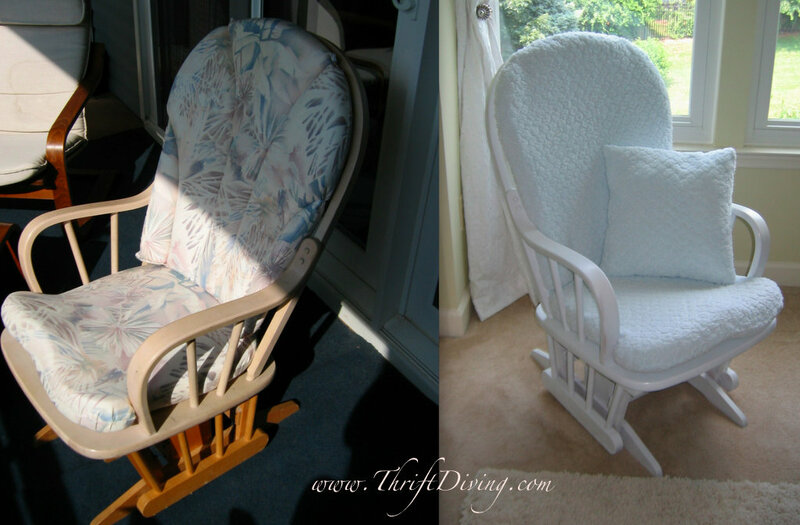 A little bit of white spray paint, and a sewn slipcover in the softest baby fabric from JoAnn’s Fabrics, and I had a gorgeous, affordable glider rocker! 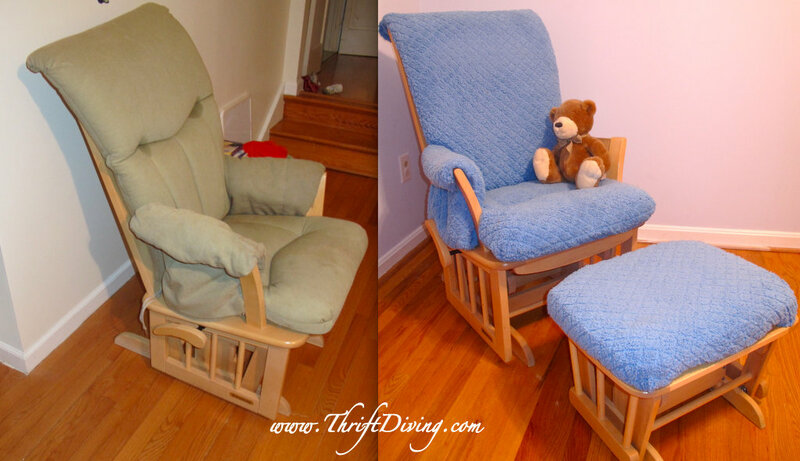 I have so many fond memories of this special chair where I nursed and sang to my son while he fell asleep in my arms (as well as my 2nd son!). Sadly, my husband threw this chair away (!!!) without my knowledge because it wouldn’t fit in the moving crate when we moved into our new house. WTH!! So out I went, scouring for a new one at the thrift store. My sights fell on this Shermag, for a mere $20! I knew immediately I had to have it. Shermags are not cheap! They average around $200. This one was in good condition, but the cushions were a bit nasty and stained. And, besides, who decorates with that “blech” tan color anyways?? STEP 1 – Wash the cushions on HOT. STEP 3 – Leave a 1″ seam allowance around the pins and snip away the extra fabric. STEP 4 – Sew around on the line where the pins are attached, leaving the 1″ seam allowance. STEP 5 – Leave one side open so that you can turn the slipcover right-side out. Insert the cushion, and then hand-stitched (or use the Heat ‘n Bond) to iron close the remaining seam. STEP 6 – Replace the cushions. STEP 7 – Unscrew the bottom of the stool, wrap the fabric over the cushion, and use a staple gun to tack the fabric. Screw the cushion back into place. Sorry, I didn’t get tutorial pics! I started this project months before I began featuring projects on this blog! Here’s another great idea for you. Do you have an old changing table? Are you looking for ways to DIY your old changing table? Turn it into a desk! Do you like buying used baby furniture, too? I do agree with all the ideas you’ve offered in your post. They are very convincing and can definitely work. Still, the posts are very brief for newbies. Could you please lengthen them a little from subsequent time? Thanks for the post. Thanks Serena – I will let you know how I go with the project! Hi, Jenna! Thanks for your comment! I spray painted it “whole” and had no problem whatsoever with the gliding motion. You might want to use a spray poly on it to protect the paint after youve painted it, so it stays nice and white. Good luck!! You’re definitely a pro! I’ve always HATED spray painting!! I usually have my husband spray paint the products that I want sprayed because I’m so terrible at it. We are expecting our first child in December and he is currently deployed. That being said, I inherited my first glider/ottoman combo yesterday from my grandmother and then looked up ideas for it. As soon as I read your blog, I headed to Wal-Mart and picked up spray primer and paint because we’re wanting to go with white furniture (and of course the freebie is never the perfect color). But I DEFINITELY applaud you on your painted chair. With all the nooks and crannies (and the gliding motion), I’m doing a terrible job at getting all of the underside poles. Did you flip yours upside down when you painted that part? I’m wondering if I should. Every time I try to get too close I nik what I’ve already painted (what a pain). 🙂 Thank you so much for posting this tutorial though, it inspired me to start a project! Now I just need to stop giving the hubby my spray painting jobs so that I can actually get good at it! I love gliders for nurseries and you’ve done a great job on both of yours! I’m looking at purchasing one. Do you have any suggestions on painting it white? Did you pull it apart or just spray paint it “whole”. Was there any problems with the gliding movement still working after spray painting? Remarkable post about choosing baby stuffs. When it comes to baby stuffs it is always practical to see to it safety of babies. This is to avoid unexpected incident among the litle folks. Stop spamming my blog, dude. thanks for suggesting these baby furniture but in my opinion baby crib is best and essential requirement for babies,parents should buy comfortable and secure baby cribs. How are your projects coming? I’m swamped over here! LOL. I’m about to start working on my “reading room” which I’m super excited about!